Gallery IS, is once again pleased to be presenting a collection of new work by Red Deer artist Lauren Cowles. 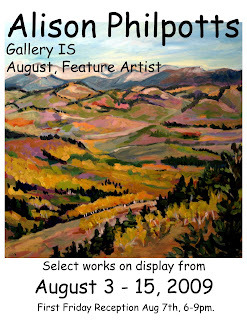 "Today I dream of......." is the second solo exhibit by Cowles at Gallery IS. 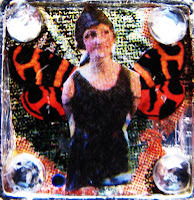 This show features her unique mixed media and collage work. The themes in this show are from dreams. Each "dream box" will be a representation of a dream that is either personal to the artist or a dream that was shared with her. 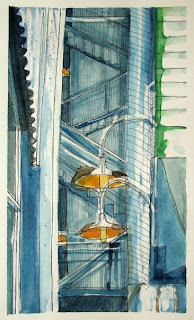 Cowles will be blogging about her progress, charting the creation of these works and also the daily life of an artist. This exhibit features the beginning of a journey. The 30 works in the series will be the first, with many more to come. "Today I Dream Of ..." will be on display from Jan 4th to 30th. The opening reception is Jan 8th, First Friday, from 6-9pm. The artist will be in attendance. Everyone is welcome. Gallery IS 4th Annual Miniatures Exhibit is in full swing. Make sure you pay us a visit during the holidays. There are many, many artworks in all sizes by all of your favorite artists. The Mini's exhibit runs until the end of December. Rikki Renard is having an excellent sale of her artwork. 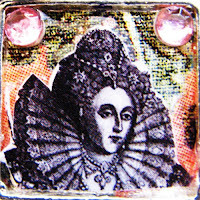 20% to 50% off of a great selection of her work. Visit the gallery to see these pieces or visit her website. We hope you have a great one. Regular Hours resume on the 5th of January. Hi everyone! Its that time of year again and we are so excited about our 4th Annual Miniatures Exhibit and Sale. Our 4th year! Can you believe it. Many of our artists have already been hard at work creating dozens of tiny treasures, but we are looking for many more artists to submit even more mini masterpieces. This show is our exciting Christmas Sale. We gear these pieces for people who are looking for that special gift. 2D works must be 50 square inches or smaller, and 3D works must be 6 inches tall or less. We encourage all media and are interested in different interpretations. 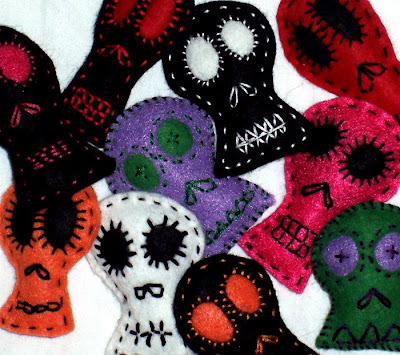 In the past we have had tiny felt shoes, handmade necklace pendants and bracelets, paintings as small as postage stamps, and small handmade boxes. Professional, emerging and student work will be considered. We are only accepting 3 submissions per artist for this exhibit. If your work is chosen to be included there is the possibility to show more than three (so get busy). The deadline for submissions is Monday, November 23rd. Notice of acceptance will be given on November 24th. SUBMISSION DEADLINE IS EXTENDED TO SATURDAY, NOV 28TH! Delivery of accepted work must be made by Monday November 30th. Official show dates are December 1st, 2009 to January 2nd, 2010. Please send all submissions to our email address. Digital images are required. Gallery IS, is pleased to be featureing a collection of outstanding paintings by Calgary artist Liba Labik. "Decoration With Hands" is an ongoing series of oil and mixed media works for Liba. The subject of hands is for Liba a way to show the greatest untapped potential in all humans. They are one of the greatest symbols of humanity and something we can all relate to. They portray emotion and age. This is a must see exhibit! It is only on display at Gallery IS for one week from the 29th to the 3rd. Artists reception is First Friday, October 2nd from 6-9pm. Everyone is welcome. The artist will be in attendance. Join us for the Alexander Way Festival on Saturday the 19th. Gallery IS shall have a booth on the street with many new artworks, and we will also have the Gallery open for your viewing pleasure. 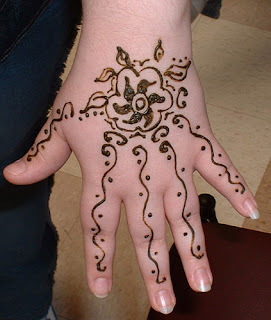 You can also take advantage of our special attraction, Henna Tattoo's! Erika Schulz will be creating this temporary body art between Noon and 4:00pm. You can get $5.00 small tattoo's, or larger designs for $10 and $15 dollars. Alexander Way Festival will be happening right beside the gallery, so make sure you pay us a visit. Look what's new- Fran Ding is now selling her wonderful, whimsical pottery at Gallery IS- just a sneak peak at some of the artwork available for purchase. Fran is a Red Deer Potter working in hand built clay- each piece is unique and the glazes used are food safe. You will love this artwork. Gallery IS, Jeri-Lynn and Erika, would like to thank everyone who voted in the Best Of Red Deer survey through the Red Deer Express. We are so happy to be the recipients of 2009's Best Art Gallery award. Come and pay a visit to Gallery IS in June and July to see the progress of The One a Day Painting Project. 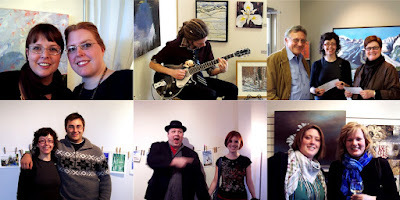 This challenge was taken up by Gallery owners Erika Schulz and Jeri-Lynn Ing beginning January first of 2009. By visiting the gallery in June you will get to see 6 months worth of artwork! An achievement all on its own and the year is only half over. 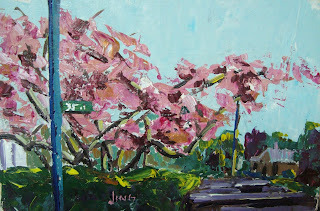 Jeri-Lynn's inspiration is drawn from daily walks in her neibourhood, and around Red Deer. You may recognize a street, or tree, or some familiar landmark from the area. 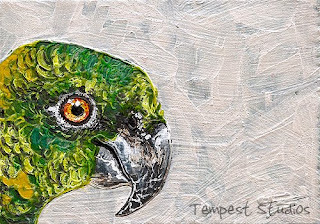 Face Off 3: Parrot. April 24th, by Erika Schulz. Erika works in series of 7. Each week she chooses a subject that interests her and works away on 7 pieces that vary that theme. Its whatever is interesting to her at the time. 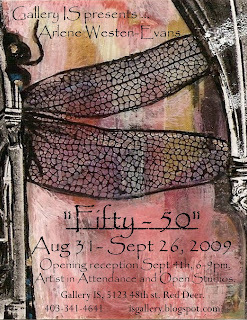 "One A Days" will be on display in the gallery from Friday June 5th, to July 31st, 2009. The show will be updated as pieces are created by the artists, so there will be something new to see every week. Each piece of artwork is for sale, and its first to come, first to own. Artists reception is on First Friday, June 5th. From 6-9 pm, everyone is welcome. 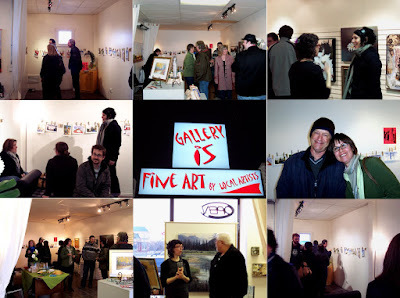 ... and fill out the survey to vote Gallery IS as Red Deer's best Art Gallery for 2009. You will find the "Art Gallery" section at the top of the 4th page. The deadline for voting is Friday, May 15th. 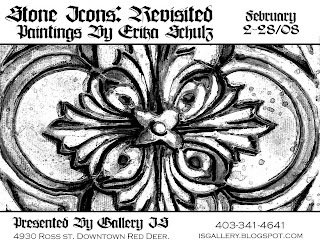 Gallery IS, is pleased to present a new exhibit by Edmonton based artist, and Red Deer College graduate, Brent Felzien. "Basement Beauties" is Brent's first solo show. This exhibit will present a series of portraits in Brent's unique mixed media style. Using a variety of materials from wood, to plexi-glass, scrap metal, cardboard, and of course paint and pastel, these works are meditations on texture and construction. His art is rooted in the presence and process of real objects. 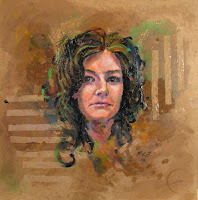 Brent looks to connect the viewer to his artwork through the gritty nature of an unrefined surface. On exhibit from April 27th to May 23rd, 2009. Opening reception on First Friday, May 1st. From 6-9pm. 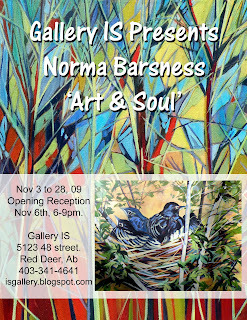 Gallery IS, is very pleased to be hosting the first solo gallery exhibit by Red Deer artist Justina Smith. We have been watching Justina's growth over the last few years and we are so happy to be representing her and her work on a more permanent basis. "Canadian Clothesline: A Brief Look At Our Intimates" will be the first exhibit in the new Gallery IS space on Alexander Way. 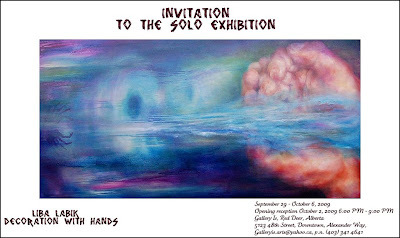 This solo show is a pictorial journey of the artists journey across Canada in 2008. Starting in BC in September and ending in a round trip, winter driving, expedition from Red Deer, AB to Moncton, NB. "I took a lot of photos along the way, and I thought it would be neat to document the trip in a manner that was fluid and simple. Watercolor and pen are great mediums to capture moments quickly, so I thought this would be the best way to express these pictures. And since they are little paintings, it’s just a brief look." Brief, intimate and extremely diverse describes this show and the journey of the artist. Justina takes the viewer along with her on her journey sharing the various places through her intimate perspective and sense of whimsy. Exhibit runs from March 30th to April 25th. Opening artists reception is Frist Friday, April 3rd from 6-8pm. Live music, food, and drink plus the artist will be in attendance. We have to thank you in advance for your patience. There are many things happening at Gallery IS. First, we would like to apologize for the erratic hours of late. With the cold weather, the low numbers of visitors, and recently a burst pipe, we haven't been able to keep regular hours. If you need to view some artwork and we are not at the Gallery, we encourage you to arrange for an appointment, and we will be glad to meet you. You read that right, we have had a flood. Unfortunately this has created a myriad of problems, and we are very sorry for this. Fortunately we escaped without any damages to anything other than the space itself. With all the goings on our plans to move on the 28th of March, to our new space on Alexander Way, might be happening a little sooner than expected. Keep an eye here for more information, or you can always just give us a call too. Stay tuned, and see you very soon. Erika Schulz and Jeri-Lynn Ing. Owners. 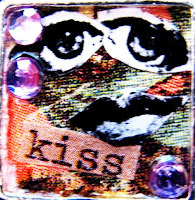 eye on our blog for important updates, solo show annoucements and First Friday events. 6th from 6 to 8pm at our Current Local.